Well these naughty little treats are well….naughty but oh so necessary. 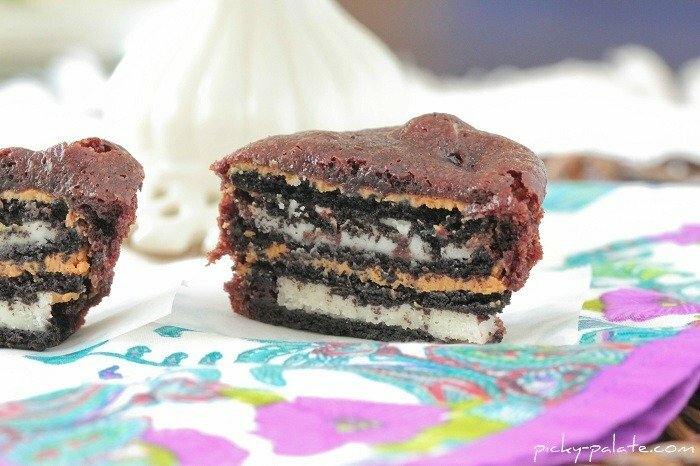 There are a bit like my Brownie Covered Oreo’s from last Christmas but enhanced with layers of peanut butter and a double decker stack of Oreos in each little brownie cake. They are simply prepared in cupcake liners. Break out 24 Oreo Cookies. 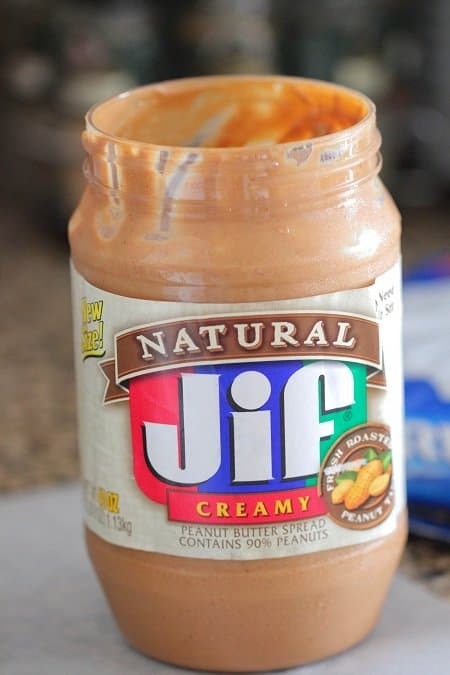 Some of your favorite peanut butter. 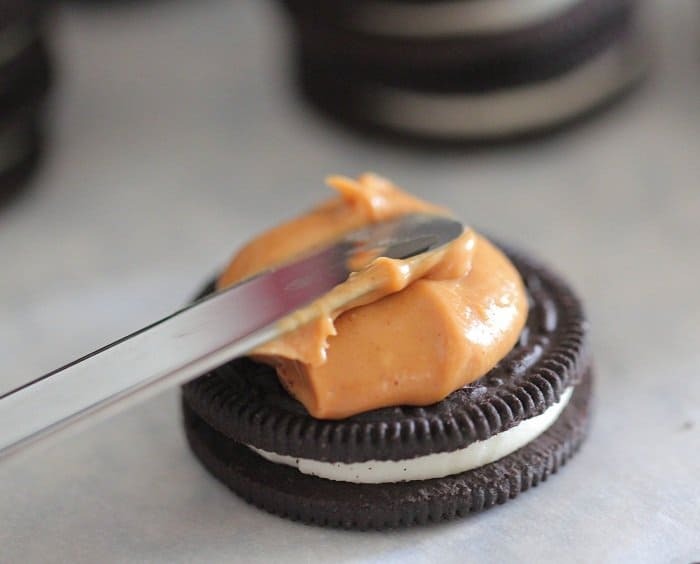 Spread a teaspoon of peanut butter over Oreo #1. One more teaspoon right on top. Place the little stack right into a cupcake lined muffin cup. …and spoon a couple tablespoons right over top, letting it run around the edges of the cookies. Mmmm! Time to bake! 350 degrees F. for 18-20 minutes. Ahhhh, wait until you cut them in half. Too fun! 2. Prepare brownie mix according to package directions. 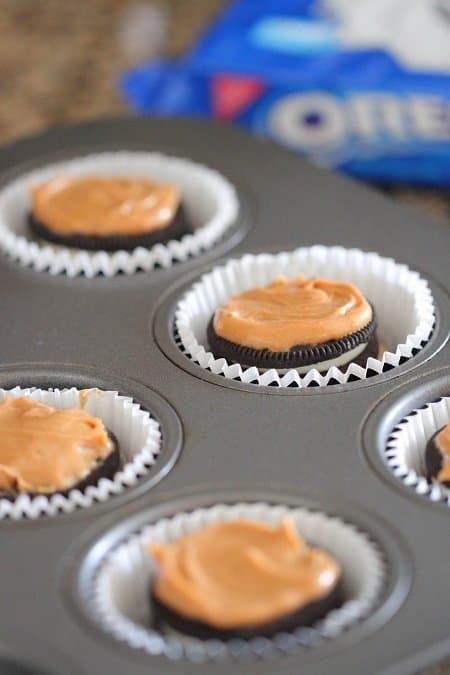 For each cupcake cup spread 1 teaspoon of peanut butter over 2 Oreo cookies and stack them on top of each other. Spoon 2 Tablespoons of brownie batter over each stacked oreos and let it run down the sides of the cookies. 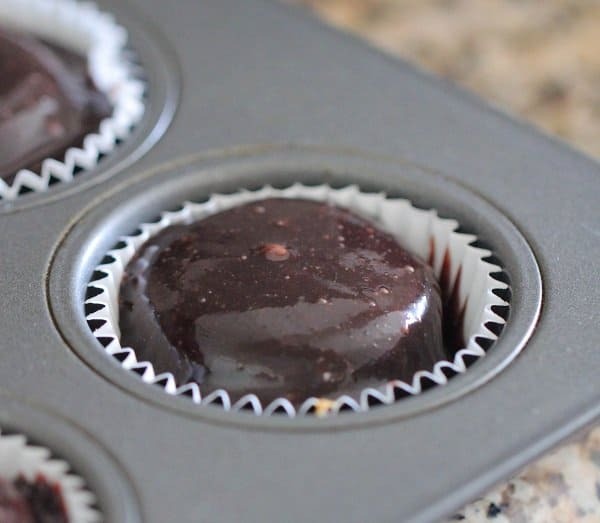 If you have left over brownie batter, bake separately in a separate baker or muffin tin. Bake cookies and brownies for 18 to 20 minutes, until brownies are cooked through. Let cool completely then serve. You’ve done it again Jenny! 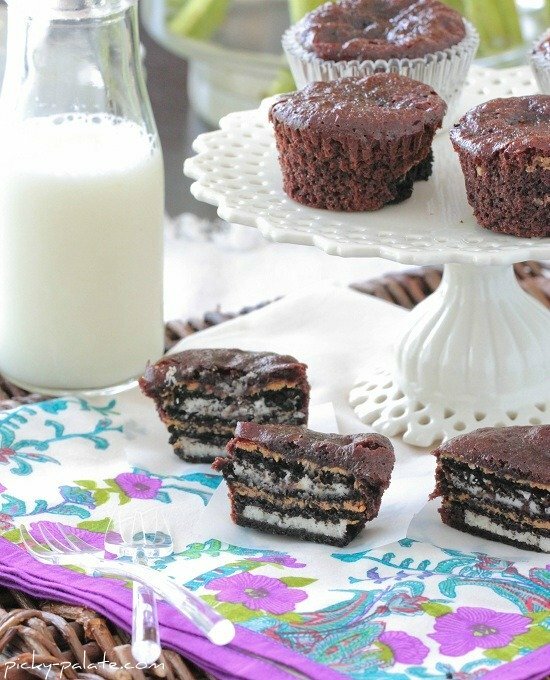 I love the combination of oreos and brownies and these look so adorable and fun. Jenny these look amazing! I have that exact kind of peanut butter & oreos on hand. And I’ve had that TJs brownie mix IN MY HANDS about 7 times and have never bought it b/c I have always thought…well, how good could it be. Ok, now I know. And wow, you are sooooo creative! I am impressed with the cross section slices in the 1st pic…so professional! You are killing me with these- just too good! You are my hero. These look freaking awesome! Woah, you’ve done it again Jenny! These look awesome!!!! These look incredible! And thanks for the tip on the TJs premade mixes! You won’t be disappointed in their brownie mix, it sure makes for an easy treat! Thanks Tara, hope you enjoy!! So fun! And a little too easy to make…could be dangerous! I know, way to simple to make!! I love this so-simple idea for a dessert. How about frosting on top too??? No, too much, I think! after trying them today…IMO that adding frosting might be too much sweetness to something already very rich in taste. I should not read blogs first thing in the morning. Now I want brownies and Oreos for breakfast!! Dear god, its good to be bad! And these – these are perfection! Oh wow – this is amazingly simple and delicious! 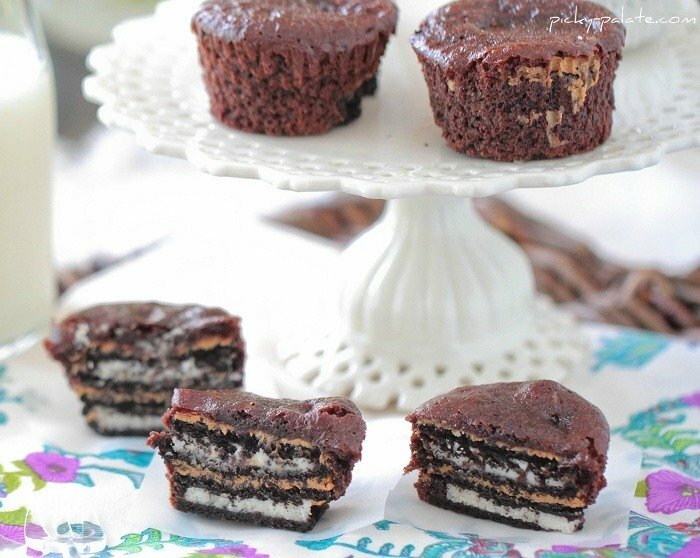 What can be better than Oreo’s, Peanut Butter and Brownies – heaven! I’m thinking a cream cheese, sugar, egg mix in place of the peanut butter and I might die of gooey goodness. thanks for the amazing ideas! oh jenny. you are evil and clever. this is genius!!! they are adorable and look like such a delicious little treat! 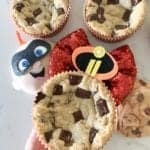 Ooh…these look so good, and easy too! I’m dying the most beautiful death right now. So I was tempted enough to go ahead and make these with my 7 yo daughter this afternoon….we just taste tested one….definitely a yummy combination. 🙂 My crew is going to like ’em! I went ahead and used a pkg of Oreos along with a 9×13 pan size brownie mix. 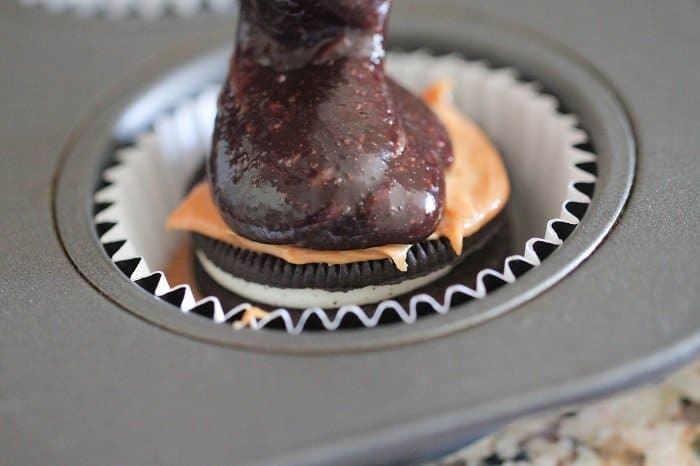 I didn’t measure the peanut butter(creamy Jif-not natural variety) I just used my Pampered Chef small spreader and spread a layer on each Oreo. Prep time was about 10 minutes and bake time was closer to 30 minutes. Total made 21 cakes. Thank you posting such a great review for the rest of us. And thank you Jenny for another winner! OMG, i love this!!! What an amazing idea, and soo easy. Im a much better cook than I am a baker (I hate measuring!! ), so these are perfect for me. These remind me of my freshman year of college when I started dipping everything in peanut butter: oreos, red vines, graham crackers. And I gained the weight to prove it. Ha ha. But these sound to-die-for-yummy. LOVe it! 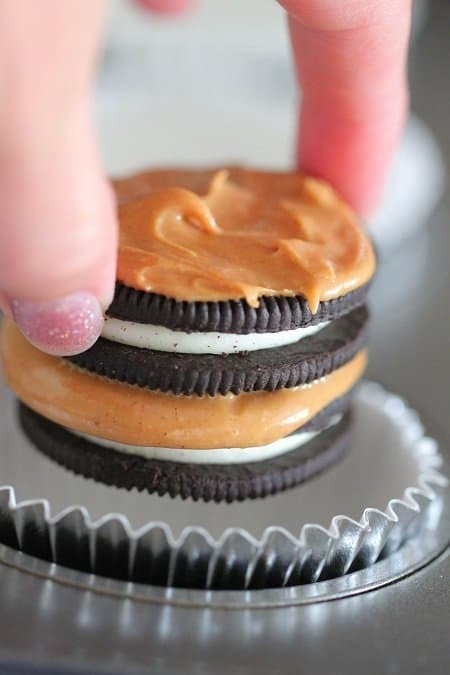 I haven’t had oreos and PB together but that is looking pretty good to me! if i dont have TJ brownie mix, is there another brand you recommend? I am going to make these with the Biscof I just found at my Wal Mart in Laguna Niguel. Look yummy! I just put a triple batch in the oven. This is what I’ve discovered: You need to really make sure to match the brownie batter consistency with what Jenny pictured above. On my first try the batter was thicker and would not run down the sides so easily. When that batch started to cook in the oven, I had no control which way or direction the batter would slide, so some went off the side. 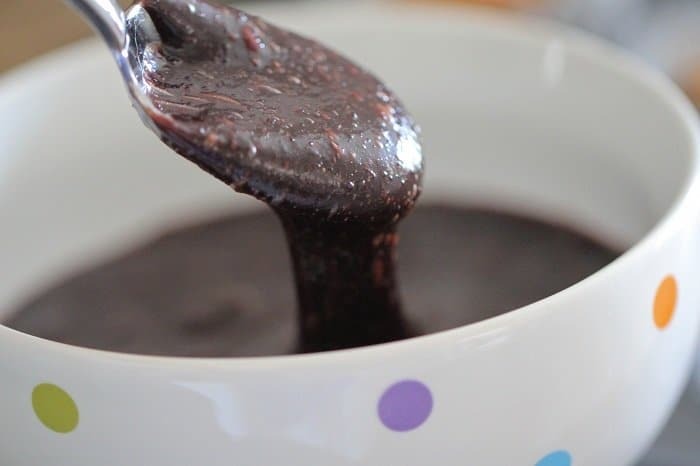 I used the Ghiradelli brand for the brownie mix, added vanilla extract and a TB of cocoa, replaced the water with milk and replaced the oil with butter. I used the Halloween Oreos that are in the store now because I am making these for my daughter’s Fall Festival at school. I had cupcake papers that are black w/ a candy corn design and then I am going put these in a clear plastic bag and tie it off with an orange ribbon. GuRl, puuulease. You be trippin out!! *z-snap* JeNnY knowz hur sH**t! If it ain’t broke, don fix IT! REALLY?, halloweenoreos? that sh**t cray! i can always count on you to make me drool over your creations. good grief, these look divine. 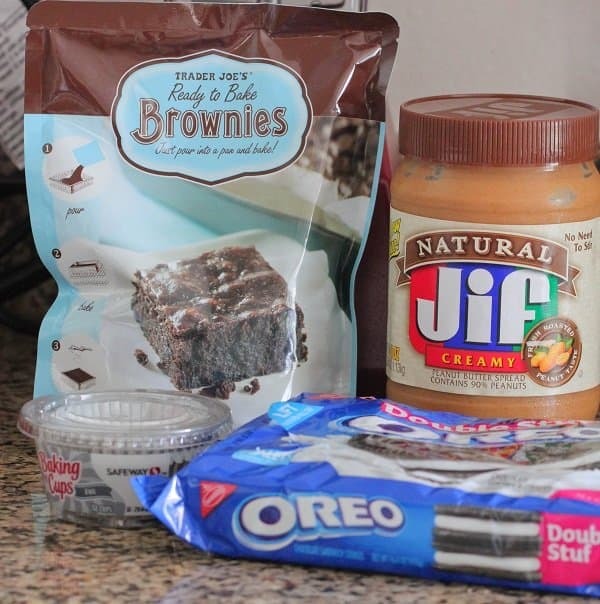 Made these with what I had on hand…double stuff Oreos, creamy Jif, and a 9 x 13 brownie mix. I made the brownie mix with the “fudgy” version, but I’m thinking the cake-like version might have been better (more runny). One mistake I made was not using enough peanut butter. 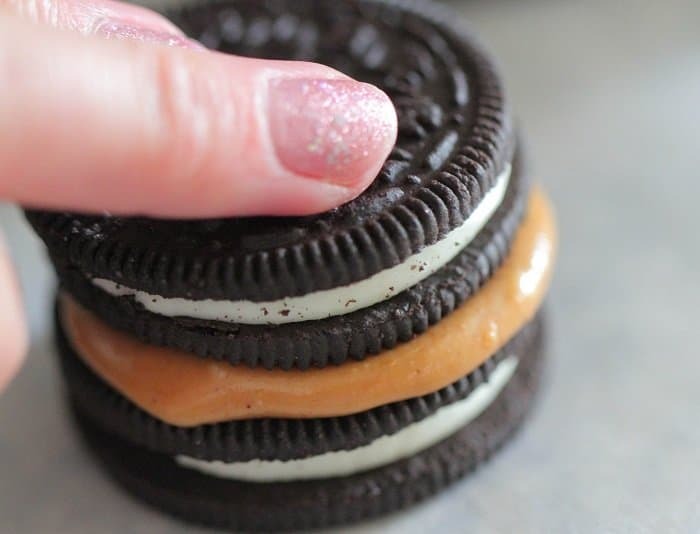 I used less because I was afraid my stack would be too tall with the double stuff Oreos, but I really couldn’t taste the peanut butter. I made a total of 18 of these, and it seemed perfect with the 9 x 13 mix. I put the mix on the Oreo stack, let it sit for a few minutes, then added more. Turned out perfect. They baked for about 25 minutes. Oh dear! 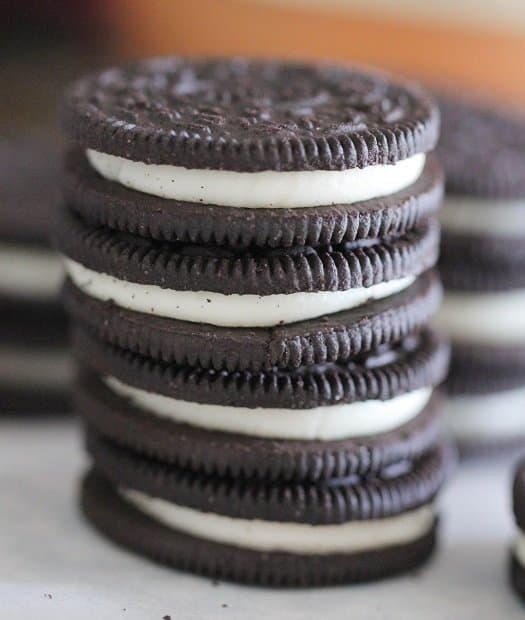 You are the Oreo Queen! You never cease to amaze me and entice me with these fabulous desserts. YUM! This smart Oreo inclusion reminds me of a smoothie served at Paul’s bakery in London with… a French macaron inside! Bravo Jenny for the creativity and the simplicity! Just made these. They were very good. I found if using the Trader Joe’s brownie mix I could get 21 brownies made and that way I didn’t have to bake off the rest of the brownie mix (or maybe I didn’t put in enough batter? I think I did though as it was very full). Personally I think I’d like a little more brownie in it so I may try it with just one oreo and some peanut butter on top and bottom. I love the addition of the peanut butter! The only other problem I had was that my muffin wrappers stuck to the brownies a bit. I waited as long as I could to dig in so maybe it was because they were still a bit warm. Anyway, I love your creations. They are creative and bring something new to old ingredients. Easy and sinful, the best kind of treat! Yum! 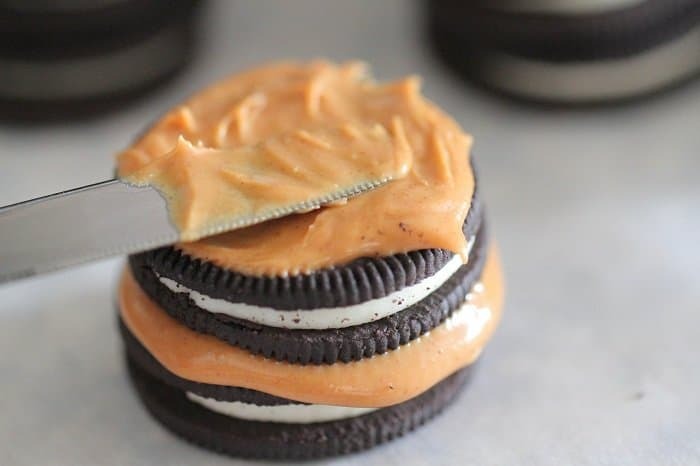 Peanut butter and oreos is SUCH a good flavor combo! Oohh, this alsmot looks too good!! I love when such simple things (like oreos and box mix!) come together to create something so unqiue. Wonderful! UGH! Shut up and go away! Do you read “food blogs” just to make snide remarks or just so you can be a b***h? Oh my heavens. I’m afraid I would be powerless around those!